*Tours starting at $74.00 per paddler - For same day availability please call! • Departure location is Split Rock Lighthouse State Park (unless Palisade Head is specified). Paddle beneath the towering cliffs and over the deep clear water of the world's largest lake from Split Rock Lighthouse State Park. With our tours you'll get magnificent views of the iconic lighthouse. Paddle a bit further and you'll get a chance to spot the Madeira, wrecked on November 28th, 1905. We offer two tour durations for our North Shore paddle. The two hour tour is only available for the Split Rock area. You'll paddle beneath the lighthouse and across to Gold Rock Point. Our four hour tour takes you back south to some impressive cliffs and a picture perfect beach for the included lunch. After a bite to eat spend some time to search for some agates or fossils! Split Rock Lighthouse State Park - This is our most popular North Shore tour. Explore the rocky coastline and get excellent views of the iconic lighthouse, serene bays, and towering cliffs. If the Lake allows we can see the wreck of the Madeira below. Wreck viewing is weather and water dependent and not guaranteed. This is the only departure location for our two hour tour, and is the default location for the four hour paddle. Palisade Head/Tettegouche State Park - Already paddled at Split Rock? Head further north and check out our Palisade tour. With classic North Shore scenery of big cliffs and endless horizons you will find plenty of opportunities to be amazed. You'll also see the caves and cliffs of Palisade Head and the scenic Baptism River. This departure location must be requested during the checkout process. *Starting at $49.00 per paddler - For same day availability please call! 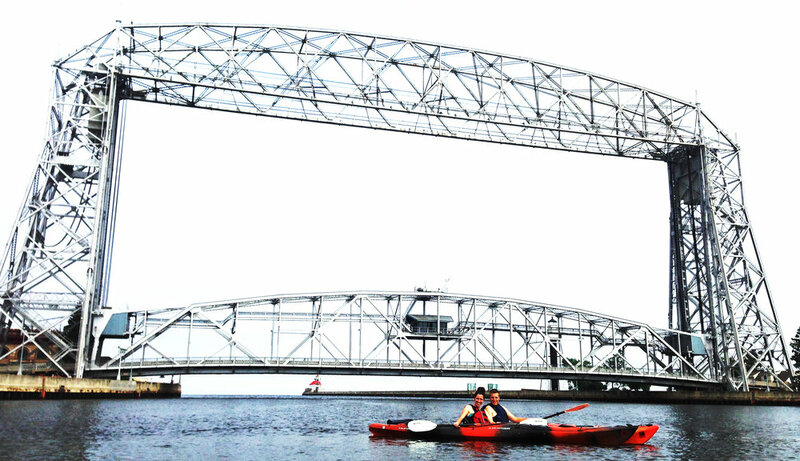 Sitting at the far western tip of Lake Superior, Duluth has some of the best paddling right in town! 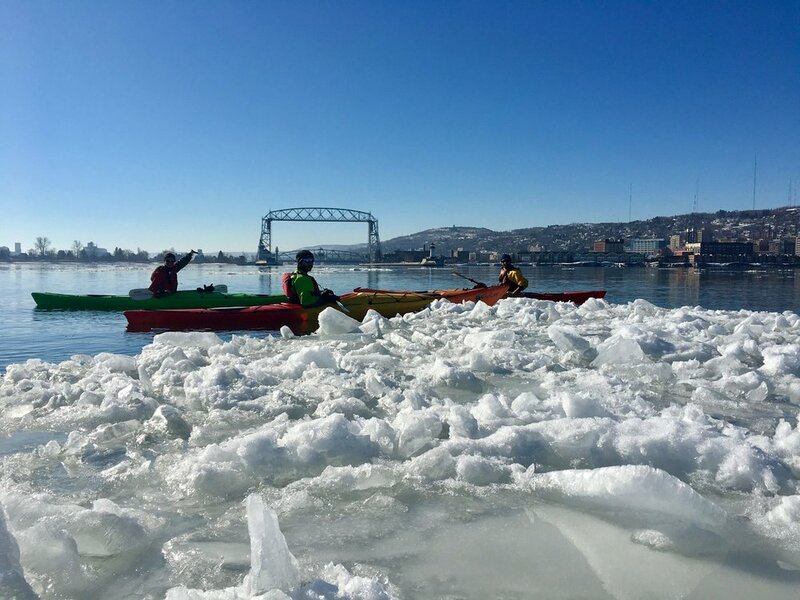 With everything from rocky beaches, forested islands full of wildlife, and the historic Duluth harbor there is something for every paddler to get excited about. We offer two and four hour Duluth area tours. Our two hour tour is offered daily. Our four hour tour is offered on Monday and Tuesday. A gourmet trail lunch from Sir Ben's is available for the four hour paddle. Enjoy lunch on a picturesque beach and hunt for some agates before we head back out! *Day Tripper of Duluth reserves the right to change departure location due to availability, weather, or other events. Brighton Beach - This popular rocky beach, located on the east end of Duluth, is the true start of the North Shore. Departing from here, you'll paddle north along the scenic rocky coast. Heading south, you'll enjoy the views of Duluth's famous homes such as the Glensheen Mansion. Park Point/Canal Park/8th Street Beach - Departing from the harbor side of Park Point, you'll paddle along the scenic harbor and Canal Park. There you'll learn the history of the port, get some amazing views of the Aerial Lift Bridge, and watch ships pass by. If conditions allow we will head out under the Aerial Lift Bridge into the big Lake. St. Louis River Estuary - Explore one of the few freshwater estuaries in the world. This is the best option for wildlife viewing. As we paddle among the forest islands of the river we will have a chance to see an eagle's nest and often fish jump right out of the water! Learn about the importance and history of the area to the Native Americans and fur trading voyageurs. Hop on board the historic LSMRR train and let the locomotive take you upstream to the waiting kayaks. The kayak will take you downstream along the historic St. Louis River from Boy Scout Landing back to our departure location at Clyde Ave. There are many opportunities for bird and other wildlife viewing as we wind down the river. The train ride takes approximately 45 minutes, while the paddle takes around 2 hours 15 minutes. Train tickets and everything kayak is included in the tour cost. This tour is also offered with our 10 person north canoe. Please contact us to set up the tour. Price per person with the canoe option is $62.00 each, there is a 4 able paddler minimum. The original Lake Superior & Mississippi Railroad was the first railroad into Duluth. After several years of surveying, preparation and laying track, the first train traveling from St. Paul arrived in Duluth at 11:30 PM, August 1, 1870. The advent of this rail link was considered the most important event in the history of the state of Minnesota, as well as in the railroad development of the country. The 154 miles of track connected the head of navigation on Lake Superior with the head of navigation on the Mississippi River. This opened up a viable means to transport goods to Lake Superior for shipping to Eastern markets. The section of track from Thomson to Fond du Lac, known as the skally line followed the St. Louis River through Jay Cooke Park. This portion of the original track had uneven terrain, a steep and long (nine mile) grade and high wooden trestles. These trestles were difficult to maintain and posed a fire threat due to the wood burning locomotives of the day. The Duluth Short Line Railway built an alternate route into Duluth in 1888 largely following the current Munger Trail eliminating the dangers of the skally line. Duluth and Lake Superior aren't known to be the warmest. Ice on the big lake is common every winter, and when the weather warms up the shattered lake ice and icebergs make for some spectacular scenery to paddle in. With ice forms varying from 20 foot high cliffs to thin layers you can paddle through each tour is totally different. With Lake Superior's often clear waters you can not only see the ice from above, but see the iceberg extending into the chilly depths of the lake! Depending on ice and wind conditions we will explore the icy lake and shore starting from the historic Canal Park area or the rocky shoreline of Brighton Beach. This tour is not offered regularly as the conditions on Lake Superior are constantly changing. We typically announce a tour 4 or 5 days in advance based on the forecast and ice conditions. Please check back often for tour date announcements! What to wear: We suggest you wear some tight fitting long underwear, pullover style jacket, warm winter hat, wool socks and footwear. A wicking fabric is highly recommended, and cotton anything is not suggested. The air is warm, but your feet will be on the cold floor of the boat! • There are currently no Superior Shipwreck specific tours scheduled for 2018. Please contact us to set up a tour. However, the wreck of Madeira is highlighted on our North Shore Kayak tour. Lake Superior's North Shore in Minnesota has 49 known shipwrecks (and more undocumented). Many ships met their end on the rocky and rugged shoreline during powerful blizzards, and more became lost in the fog only to run aground and sink. Some of the ships were salvaged, and were so destroyed that salvage was not worthwhile. We will be exploring some of the more impressive wrecks along the shore. The wrecks vary in age from ships lost in the 1890's to slightly younger wrecks from the 1920's. All of them are impressive and have been kept in remarkably good shape due to the cold water of Lake Superior. For this tour we meet in Two Harbors, MN for our first wreck. After paddling we head to Split Rock for a paddle, then Silver Bay. Transportation is included in the cost of the tour. This is a custom scheduled tour with a minimum of 2 paddlers and a maximum of 7.